Abstract: This essay examines the transnational movement against prisoner abuse and torture in Pahlavi Iran in the 1960s-1970s. Arguing that the notion of human rights in this era was neither fixed nor stable, it analyzes the encounter between Iranian revolutionaries, students, and intellectuals and international human rights activists and organizations. 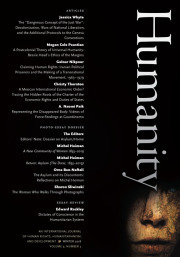 It argues that the growing prominence of prisoner abuse in Iran provided a rallying point for Iranian dissidents of various political stripes in the years before the 1979 revolution as well as a testing ground for the emergent global human rights movement at a time when this movement had not yet cohered into the industry it is today.